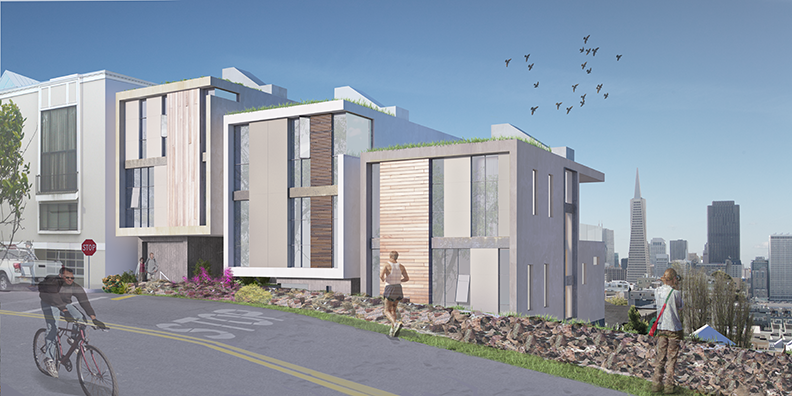 Designed by Butler Armsden Architects, the project entails new construction including a parking podium, with three single-family townhomes fully separated, sharing only the parking podium. A fourth dwelling unit is included in the scope of work, which entails a renovation and modification to an existing 1,000sf cottage located at the Southerly portion of the property. The townhomes will have stunning cityscape views. Some will have breathtaking views of the TransAmerica building. Weather Conditions: With unpredictable weather conditions, our team needed to factor in the possibility of heavy rain. We proposed two construction techniques we’ve had great success with, which would allow us to build throughout the season. The first technique employs the protection of a high quality tent. The second technique employs the use of shrink-wrap. While the tent technique will cover a large area, the shrink-wrap allows us to protect specific areas within the active construction site. Shrink-wrap provides tight containment and allows daylight into the work area. Site Logistics and Sequencing Considerations: Early on, we had to make very strategic decisions for excavation, staging, and sequencing new construction. These decisions were incorporated into a flexible logistics and sequencing plan that accommodates for unforeseen weather conditions. Decisions were also made on the sequencing of large equipment needed for shoring and excavation activities. In some cases, these decisions are based on initial assumptions. For example, we assumed we'd be able to access the site from 7:00 AM to 5:00 PM. Our schedule of activities needed to reflect this assumption. Every project requires attention to detail. High profile, high traffic sites bring new variables for consideration and deliberation. Limited Site Access: Narrow roads, tourists, neighbors, and vehicle congestion are the unique challenges facing this project. Our sequencing plan makes considerations for building activities that will face area traffic challenges, mostly exacerbated by limited space. If we are bringing in materials and/or require the use of heavy equipment on-site, we have to ensure traffic is essentially one-directional during the morning and evening peak periods. Safety: Safety is imperative for the entire team and general public. We make an effort to ensure our work crews are intimately familiar with safety orientations and safe work plans. In addition, we ensure our team is actively participating in daily jobsite inspections, construction testing and ongoing training. It is important for us to learn from what is working and what is not with the most minor incidents. Considerations for pedestrian protection including provisions for pathway lighting were included in our plan. Whether you are living in an urban environment or a suburban community, every custom home project presents different challenges. With an understanding of what these challenges may be, you should be able to find a qualified team that addresses the key areas of concern.